After receiving initiation of the Ram Mantra from his father, Swami Ramdas renounced the worldly life in 1922 at the age of 38 and wandered as a mendicant sadhu, God intoxicated, all over India with the holy Ram Mantra ever on his tongue, and with God as his only refuge and guide. Many years of wandering life brought him back to Kerala where he founded Anandashram. 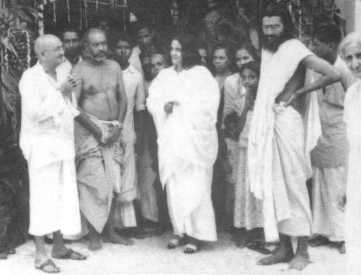 Swami Ramdas meets Sri Ma in Trivandrum on 21st of November 1952. We went to visit the Temple of Sri Padmanabhan. This is a famous temple here. The Maharaja had sent word to the temple about Sri Ma’s visit. The Deity is a massive form of Vishnu lying on His bed of the coiled Anantanag. His hand rests on a Siva lingam. The Deity is truly the monarch of the State. The Maharaja is considered to be His Chief Attendant. While we were returning from the temple we saw Swami Ramdasji on his way towards it. He is a very well-known mahatma of this part of the country. His disciples are many and from many countries. We had heard about him previously but Sri Ma had not met him so far. He was accompanied by many disciples and devotees who were singing kirtan, “Sri Rama, Jai Rama, Jai Jai Rama”. Ma went forward putting out her hands to take his – but he forestalled her by grasping both her hands in his saying, “I had a great desire for your darsana, for a long time.” Ma smiled and said, “Padmanabhji has brought about this meeting.” Ramdasji asked, “Is all well with you?” Ma smiled and said, “I am ever well.” She smiled and he also smiled back and said, “Yes, that is right, of course.” Again he said “Keep me in mind. Do not forget me”. Ma laughed and said, “This small girl is always with Pitaji. This is Pitaj’s small girl.” Ramdasji demurred saying, “It is the other way round. Then he enquired if Ma had already visited the temple. When Ma answered in the affirmative, he took his leave of her and went inside the temple. As arranged earlier Swami Ramdasji came to visit Ma after 9 o’clock. There was some conversation. After one hour or so he took leave and went away. I am mentioning a gentleman here whose name is Sri Pillai. He used to be a major-general in the service of the Maharaja. He has constructed an ashram for sadhana for himself in Kanya Kumarika. 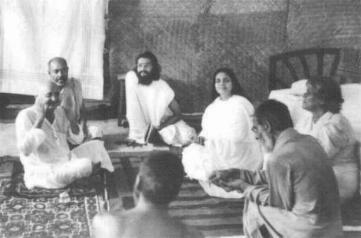 Sri Ma had visited him there. He has come to Trivandrum to make all arrangements for Ramdasji. Here also Ma visited his house in response to his eager invitations. In the evening, satsang for Ramdasji was arranged at the local Ramakrishna Mission. Sri Pillai invited and escorted Ma and the other mahatmas to this satsanga. The devotees of Ramdasji sang bhajans and kirtans. Then Ramdasji answered some questions from the audience. From The Gospel of Swami Ramdas, by Swami Satchidananda.